An odd problem, yesterday evening. My BMW Navigator 5 was nicely giving me riding instructions on my Sena SMH-10 headset, but I was unable to call my wife to let her know what time I’d arrive on our meeting point. Odd, because Garmin’s SmartPhone Link icon was visible in the title bar, as was the bluetooth icon. So my phone was connected and transmitting information to the Navigator 5, but the Navigator 5 didn’t know it was a phone? I went to check the Bluetooth setings on the Navigator. My phone was connected through Bluetooth, but the phone call functionality was unavailable. Retrying the connection would immediately fail on me. After removing and re-establishing all Bluetooth pairings on my phone, the Navigator V and my Sena SMH-10, and even rebooting my phone and switching my SMH-10 with another SMH-10 I had laying around, I did the only other thing possible: reboot the Navigator 5. Well, it turns out this solved the problem. Pairings were restored, and my Navigator 5 remembered again an iPhone is also for initiating and receiving voice calls. As I mentioned before, I ride a motorcycle with a satellite navigation system. The satnav I use is the Garmin Zumo 660, one of a few satnav devices which are waterproof for motorcycle use. When it comes to mapping data, most Garmin users can count on their Lifetime Update subscription: four times a year, you can download a new update of your map, free of charge. Now, there are people who didn’t choose the Lifetime Update subscription, and who’s map data is outdated. Or maybe you’re one of these subscribers who have noticed that the latest update still does not incorporate changes in the road layout on trips you make, and onramps and roundabouts are still missing. Or you are planning a holiday in another country, and you would need to buy an extra map, which in turn also turns out not to be up to date. That’s where my story begins, when I bought a 70€ map of Northern America for a trip through Canada, and noticed a lot of missing roads and mistakes. Are there no better alternatives? Garmin’s map data is copyrighted, and these maps do cost a fee, because making mapping data is apart of the GPS track a very tedious and manual labour. Even the Google Maps data is processed the same way, and although you can freely use their Maps app, other websites with numerous visitors need to pay Google a fee for their usage and you can’t just rip Google’s map data and put it on your own GPS device. Google owns the map data and what you do with it, and it is according to industry experts the reason Apple had to build their own mapping application and data to allow navigation on their iPhone, since Google wasn’t keen on having this feature on competing smartphones. So, you as an individual are free to use Google’s mapping app, but you’re not allowed to use it for navigation. And this is disappointing, because when you try hard enough, you are perfectly capable of making your own mapping data. You only need to make a GPS track of every road in existence, and turn it into mapping data. Now, this is a large undertaking and you can’t do that yourself. However, since 2004 a group comparable with the Open Source movement or WikiPedia started out creating mapping data to supply a rights free road map of the world. This group can be found at OpenStreetMap.org, and this website allows volunteers to upload their GPS tracks and add metadata such as street names, city names, road numbers and much more. Now, the disadvantage is that this group depends on volunteers, but because of the nature of the license used on the data, governments and some mapping companies have supplied their own GIS data to OpenStreetMap.org, which makes the data quite accurate in most western countries. However, updates to the road infrastructure are available quite quickly in the database because of these volunteers who will create a GPS track the first day or even earlier a new road opens, and will submit this GPS track and updated metadata to the database. Just like WikiPedia appears to be more correct than other paid encyclopaedias, OpenStreetMap is a very accurate depiction of your surroundings. 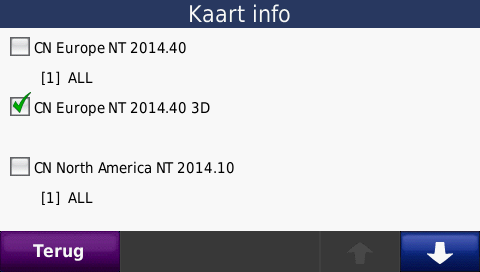 On the Garmin mapping data of 2014.40, you can still see the old layout of the exchange. The mapping data of OpenStreetMap.org shows large parts of the new layout, of roads that are currently open for traffic. The on- and off ramps to the west are not available in this mapping data, as is currently the case. 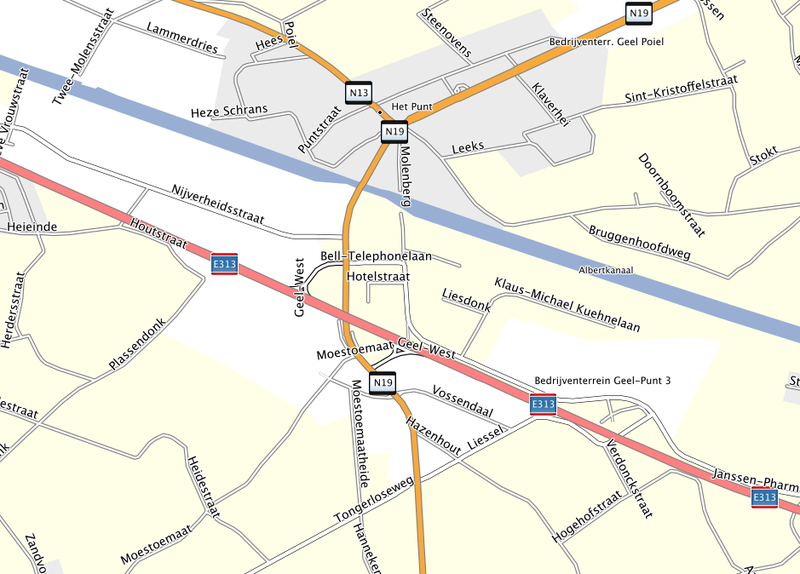 If you would be navigating from the east and wanted to go to the town of Geel, OpenStreetMap data would direct you to take the previous exit. Garmin data would take you to this exit, and tell you to take an offramp which is made unavailable. As mentioned before, OpenStreetMap has been active for already 10 years, and over time some volunteers found it although interesting this data was freely available, but went looking for ways to implement this data on actual satellite navigation devices. These volunteers figured out a way to create Garmin compatible mapping files of OpenStreetMap data, and built a suite of tools to allow us to do the same. These OpenStreetMap maps on Garmin are obviously not sanctioned by Garmin, but Garmin has not come out banned these maps from their devices. Obviously, OpenStreetMap maps are not covered under any Garmin warranty, but Garmin does not actively block these maps, and you can easily delete an OpenStreetMap map if you are worried about your supplier being difficult about any warranty issue because their is an OpenStreetMap map available. The first iteration of tools to create Garmin compatible maps were quite crude, but currently the process is as easy as using the old MapInstall. It is not as easy as using Garmin Express to update your device’s map data, but anyone who was used to MapInstall and selecting sectors can handle the OpenStreetMap way. There are no risks involved, since you can keep the Garmin maps on your device if your Garmin device has enough space left on it’s internal memory or an extra memory card, and switch between these maps while on the road. For motorcyclists and drivers, the option “Generic Routable” is best suited. If you have a GPS device for your bicycle or boat, you can use the corresponding different map types. 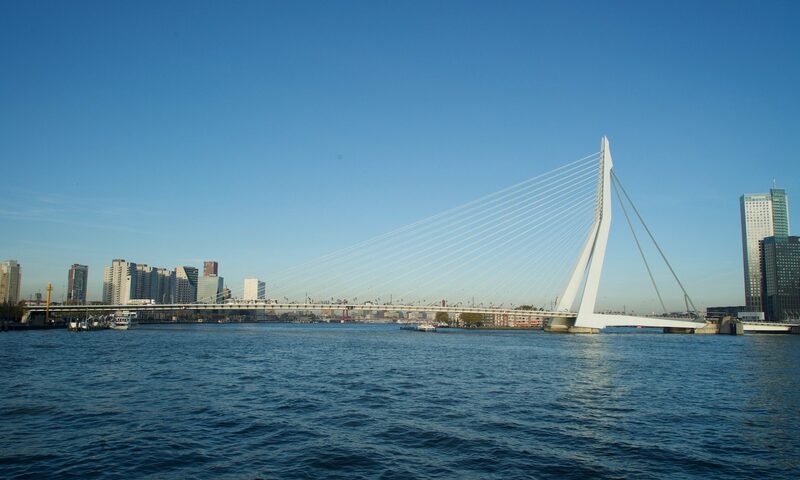 The bicycle option will for example generate a map which allows you to navigate over bicycle routes and bike paths, while the generic routable one won’t. The TYP file is optional, but allows you to select a TYP file in your map, to change the color palette on your device. Just leave it default to none right now. The easiest way is to just choose a country map. Choose out of the drop boxes the continent of your liking and find the country you are looking for. On the sector map below, you can immediately see which segments are included in this country’s mapping data, and a download link is immediately available for you to download the map. Generally, this mapping data is compiled on a weekly basis, so your data won’t be older than a week. Optionally, you can choose to compile your own map with selecting the segments you’d like to have in your map data. This is very similar to the MapInstall application by Garmin, in that only the segments you select will be downloaded and available in your GPS device. This way, you can select all map data for Western Europe, or create a map of all the states and provinces in Nothern America you are planning to visit next summer. Be mindful that selecting a large amount of segments will increase the map file size. The Zumo 660 has an internal memory size of 4GB which already is not enough for the current Garmin Europe maps, so an additional memory card in your device is strongly recommended. Once you start selecting segments, the download link disappears and is replaced by a field to enter your email address. Once you have entered your email address and clicked the Build my map button, your request is placed in a compilation queue. Once your request is compiled, you will receive a download link by email for the map data which includes the segments you selected. If you pay attention to the icons in front of the names, or the file names themselves, you can quickly discern their use. To get the map data as quickly as possible on your Garmin device, just download the file osm_generic_gmapsupp.zip. If you are interested to use the map locally on your PC in MapSource or BaseCamp, download osm_generic_windows.exe, while Mac users with Basecamp should download osm_generic_macosx.zip. Connect your Garmin Zumo to your computer with an USB cable, just like you would do to check for a Garmin map update or to upload a new route you created. 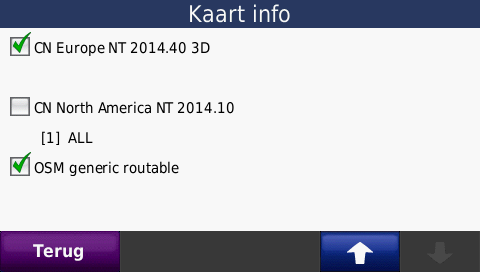 Garmin Express will check if your device is up to date, but that is no issue for your OpenStreetMap map. After this is the case, open the file osm_generic_gmapsupp.zip you just downloaded to see the file inside of this archive. This file is called gmapsupp.img and you can drag it straight into the folder GARMIN on the internal memory or the extra memory card in your Garmin device. If there is already a file with the same name, rename the new gmapsupp.img to a different name with extension .img, such as gmapsupp_osm.img. Some Garmin devices will be able to work with this name, and for others you can change the name later to a compatible name with JaVaWa Device Manager. If this is the case, or you want to fit multiple OpenStreetMap maps on one device, you can manage all your maps on your device with this JaVaWa Device Manager. You can modify the file name to a compatible name JaVaWa Device Manager suggests, and you can also rename the title of the map, so you can discern on your device which OpenStreetMap data covers which area. You need this also because if two OpenStreetMap maps share the same name, your Garmin device won’t recognise them as two separate maps. As you can see in the example, I did not change the filename nor the title of my OpenStreetMap map. I can change them by using the Edit name option in the toolbar. At first, there is nothing to see. What you need to do, is navigate to Map info. Go back to the main menu, click on Extra, Settings, Map and select in the bottom Map info. To ensure routing and map view of the OpenStreetMap map, you need to turn overlapping Garmin maps off in Map info. Only one map can be active at the same time on one location otherwise your map view and routing will become distorted. You can follow the same procedure to switch maps in Map info while on the road. To get this map working in BaseCamp or MapSource, you can connect your Garmin device again to your computer and select the device’s map in your application, but it is easier to have a local copy of the map on your computer. I assume you downloaded the other files mentioned in your download link or email. To install that same map on your PC, it is as easy to run the file osm_generic_windows.exe. This installer will place the map in the correct folder for BaseCamp and MapSource. If you are using a Mac, it is a bit more work. 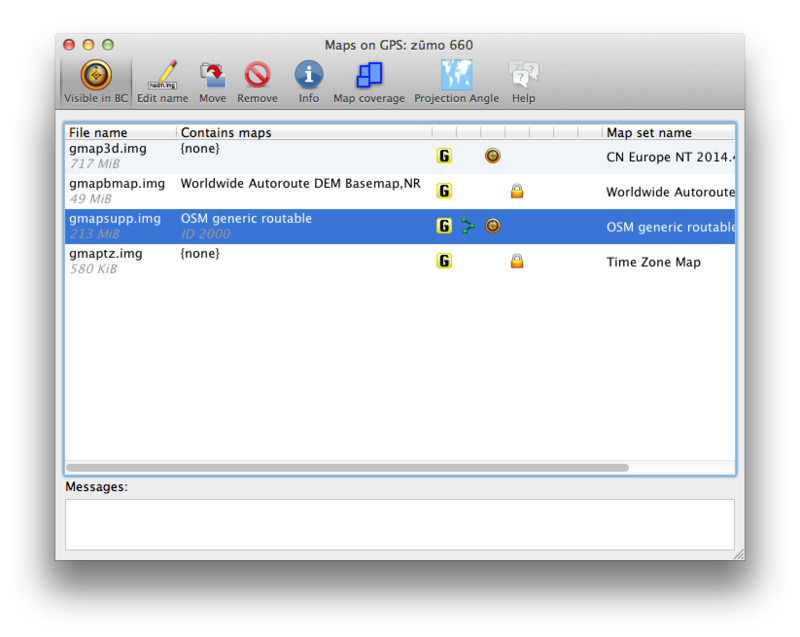 After unzipping the archive osm_generic_macosx.zip, you have a folder called OSM generic routable.gmap. You need to move this folder to the location where your other maps are stored, and this is ~/Library/Application Support/Garmin/Maps. To get there, you need to open a Finder window, click on the Go menu and hold in the Alt key to show the Library folder in the list of locations. Click on Library, and once there you can navigate to Application Support, Garmin and Maps. Move the folder OSM generic routable.gmap to this folder and your OpenStreetMaps map will appear in the list of available maps next time you start BaseCamp. If you want to use more than one OpenStreetMap in BaseCamp, you need JaVaWa GMTK to modify the maps’ name and title, just like on your Garmin device. There is no Garmin Express for OpenStreetMap to download updates easily to your device or computer. This is also quite difficult to implement, because each change a volunteer makes to the map is an update, and you can easily have dozens of updates every evening. To update your OpenStreetMap manually, you need to follow the same procedure as installing a new map, with that difference that you overwrite or delete the old map. In exchange for some manual labour, you gain very current and correct map data. With enough memory on your memory card or internal memory, you can always fall back on Garmin maps. The navigation voices can also read street names, just like with your Garmin maps. Some functions are omitted on OpenStreetMap, because they are not implemented yet. You can still use your POI’s, but OpenStreetMap maps do not contain information on speed limits and no Junction View and Lane Assist, so you do miss the ability to see which lane is best for your next exit. That is you you. For me personally the OpenStreetMap data is very complete and much more detailed than Garmin’s, but I do miss Junction View and Lane Assist. For my next trip to Canada it is a no brainer though; the North American Garmin map will be replaced by OpenStreetMap because of it’s accuracy. It all goes a bit haywire on the iPhone 4S though: instead of simple voice commands, the speech button on the Garmin Zumo 660 starts up Siri on the iPhone and Siri will accept voice commands. That’s the good bit. The bad bit is that if you’re not quick enough giving your voice command and receiving an answer from Siri, the Zumo will end the voice dialing phase with an error saying that the phone does not support it, breaking off your dialogue with Siri. So the basic premise is: Yes, Siri can work for you on your motorcycle, but Garmin needs to modify their firmware to recognize and treat Siri differently than any other voice dialer system.